It had been assumed that although AT&T has fielded a faster network compared to Verizon for years that LTE would bring parity between the carriers, but a new study has found that AT&T's fledgling LTE network is upwards of 30% faster than Verizon's. The study was conducted by Metrico Wireless in the 5 markets where AT&T has LTE built up and compared with Verizon's LTE network in those same markets. The devices used were the HTC Vivid and Samsung Galaxy S II Skyrocket on AT&T and the HTC Thunderbolt, Samsung DROID Charge and Motorola DROID Bionic on Verizon. Metrico found that stationary HTTP download and upload speeds were comparable, but that AT&T had a mean download speed 30% higher. This only comes out to a difference of 10.2 Mbps on Verizon compared to 13.8 Mbps on AT&T, which for most activities isn't really that noticeable of a difference. Metrico found that both networks had average speeds over 10 Mbps and peaks above 30 Mbps. Metrico did make it clear that it should be kept in mind that Verizon has been building its network for about a year and there are far more subscribers on it than on AT&T's network, so that could have affected the results. This is possible, but LTE networks are designed for heavy workloads, and AT&T has always prided itself on being faster than Verizon, so it certainly wouldn't be surprising to see these numbers hold true moving forward. Thats great, but a fair comparison would be to compare ATT speed with VZW when VZW first released their LTE network, meaning there was almost no congestion. Exactly. When Verizon's LTE first went live it had phenomenal speeds but every tech writer made sure to mention that speeds would probably drop when more subscribers did and sure enough, they did. Thankfully, they dropped to the level that Verizon has advertised as real world performance so good on them. What does AT&T expect their real-world throughput to be once they've switch a significant portion of their subscribers? Features and function (and hopefully price) is where carriers should be competing, because the consumer wins. Buying up competitors is not the way to compete. 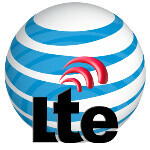 Personally, I hope AT&T and VZW go balls to the wall competing in the LTE space. It will have the side benefit of forcing Sprint to step up its game and the same for T-Mo. Nothing like a 4-way catfight. Consumers win. Exactly! When LTE first came to my area (Portland, OR), I was getting speed in the upper 40 Mbps!! And even now I'm almost always in the 30's. you guys have already hit the main point on that. its easy to look fast when no one is on the network. Lets do the test again in a year and see what it looks like. Show me AT&T's LTE coverage... that's what i thought. :D And what little there is, there is nobody using it to tie up the speed at this time..
Bottom line speed isn't as important to me as coverage and reliability. If they can match Verizon in that regard, then I would actually commend them. Question is, is this based on lab tests or field tests. Are you the same distance from each tower? How many users are accessing said tower? etc. LTE has a much higher bandwidth than 3G but it's still gonna have speed variability depending on a ton of factors. Consumer tests like this are good if you're the consumer in that spot, but for most of the people in the country this is worthless. 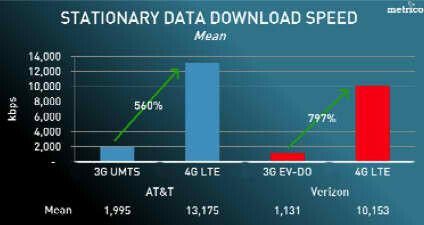 I could not imagine a more premature and technically flawed comparison of AT&T's LTE network performance vs VZW's. It's like comparing two 747's, one loaded and the other empty, to see which one takes off quicker. Duh!! well that's why there should have been more research one before releasing this unfinished not accurate reports. Just like calling hspa or whatever its calls an others 4g. Also even the iphone4g is confusing in that it is misleading and most people believe what there reading and among other things it gives salesmen the ability to mislead people. I don't really care if att is faster. As of right now the servers we get our data from mos likely not be able to give the data fast enough to really differentiate between the two in real-life situations. Also with large files people will use WiFi more often to cut back on usage. The only difference is transfer from device would be different. The most important flaw is I get such different readings every speed test and download and uploading files that there is no way that's accurate. I have had a 38 mg download and a 24 upload max reading.average 20 and 10 respectfully on a crowded network. This report is worthless. Five years from now it will matter to me and I might switch carriers. I live in Sacramento, CA and sell Verizon as an indirect rep. for VZW and AT&T. Verizon provided us a Droid Razr. The speeds I am getting consistantly are 28-34 mbps down, and 12-14 mpbs up. Those are the same speeds I saw when the network was launched in mid June. I don't really see how you can make an argument about bandwidth and congestion when the network that has been active for 6 months has stayed at the same speed. People are buying Verizon 4G LTE phones like crazy now, but the network was virtually empty in June and July. If AT&T's speeds are higher, they are higher. AT&T deserves a most criticism of what it gets, but when a network is faster, no amount of cheerleading is going to change that. I think your phull of it. Your telling me you get the exact same readings every time. I don't think so. You must own and iphone. I do agree what's faster is what's faster. A the same time it way to early to tell. If art gets the exact same readings every time than well that would be way better. Most important is why do I care sorry all. I am a sales manager for an at&t direct dealer in Michigan. I love all the opinions people have on here. Heres mine. It doesnt matter whos faster than who. When true LTE rugs the united states for at&t and Verizon, the better customer experience in store will matter the most. Even tho I am a at&t guy, I give credit where its deserved and Verizon has it. Sprint is still the little brother of the BIG 3. I never bash any other company, just because their also trying to get ahead in the business. at&t does have cheaper data plans though, but the plan prices are sooo close anyways. Everyone needs to compete. Dude, thanks, respect for you. For some reason people don't want to accept the truth, they don't believe anything even if it's proven. Even writing this, you can see people didn't like what you said because you proved them wrong. This is coming from a verizon rep. wtf, why would he lie? Poor AT&T. This is the first good news for them since the T-Mobile fiasco and no one will give them a moment to enjoy it. If nothing else, spot them this: At least it shows the promise of them building their LTE the right way and it has the potential to be a really good network. No, they will never catch up to Verizon unless Big Red lets them. I fully expect Verizon to be improving it's network to be even faster before AT&T finishes their roll out. But this is a great start for them, and it is good for those with LTE. I very the let on both are the same and its more likely the device and distance and angle and blockage from the towers that's it. Wow, falwed network? You do realize that HSPA+ is tons faster than Verizon 3G? Both LTE 4G networks are fine - just depends on coverage and on the phone. Enjoy it no matter who you have. I don't think att is a failed network either but its nowhere near VZW's. Here's the thing...I always hear how much faster AT&T is supposed to be and see the speedtest that are supposed to confirm that as well. But why does it not translate in faster load times when you compare phone to phone/page for page? VZW will most often beat the AT&T device 50-60% of the time. I mean, look at the 3 way speed test between the three iphone 4S's. The VZW version KILLED the other two. So what is it that we're not seeing, that AT&T customer are? Where was that 3 way comparison? I missed it. That was a smart tactic used by AT&T to upgrade their HSPA network, in order to enable faster connections in places where they would either take long to expand their LTE network to, or to make up for locations with low LTE signal. If only Verizon had upgraded their CDMA network, then it would have been at least on par with AT&T.